Coffee and dessert go hand in hand like peanut butter and jelly, night and day, or Thelma and Louise. 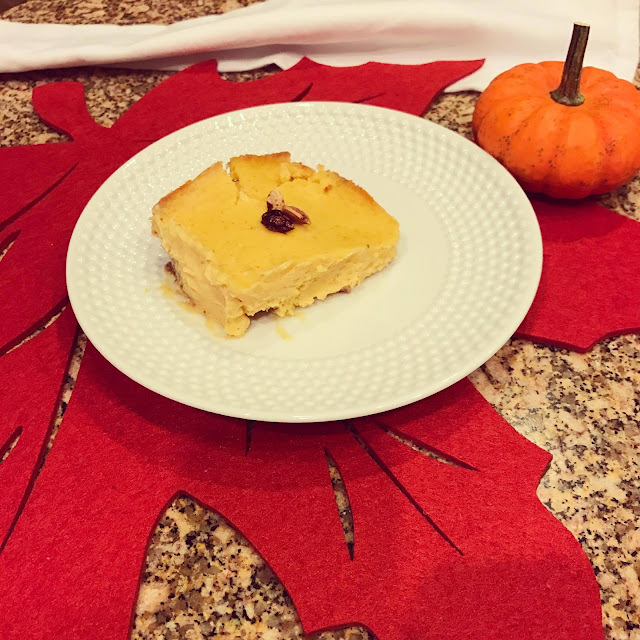 I've teamed up with three blogging friends who love coffee and dessert as much as I do to bring you three of their favorite fall desserts to pair with three specialty coffee drinks I've made in the Ninja Coffee Bar System. 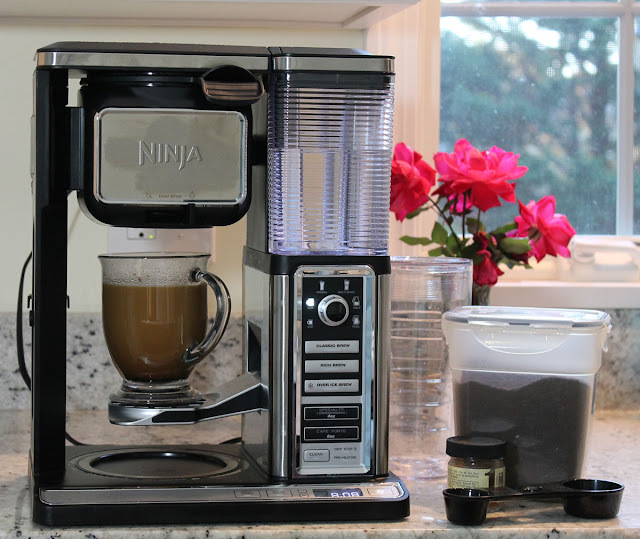 I was very excited to receive this Ninja Coffee Bar System (Model CF092) to review. I am by no means a coffee snob but I do like a good cup of coffee. I also like a coffee maker that is easy to use and can be depended on to produce a consistent cup of coffee day-in and day-out. In the past few years, I have used a Keurig single serving system, a French press, and a Cuisinart drip coffee maker. The Keurig is sitting on a shelf in my basement, the French press is on a high shelf in the kitchen and the Cuisinart sits in my beverage center waiting for me to return to it while I take the Ninja Coffee Bar System for a test drive. I have been using the Ninja Coffee Bar System for four months and have been putting it through its paces. It sure is a looker! The combination of stainless steel, glass, and black looks very attractive on my kitchen counter. The Ninja Coffee Bar System is so versatile it boggles the mind. You can make a full carafe, a half carafe, or a single cup, in five brew types using the permanent basket. I love that no coffee pods are necessary. The classic, rich, over-ice, cafe forte, and specialty coffee brew options mean that nearly everyone can find a brew that meets their fancy. You do have to read the manual to choose the appropriate amount of coffee to put in the basket, but selecting the various brews takes just a push of a button. I've fallen in love with the rich brew for a deep rich cup of coffee to start my day every morning. 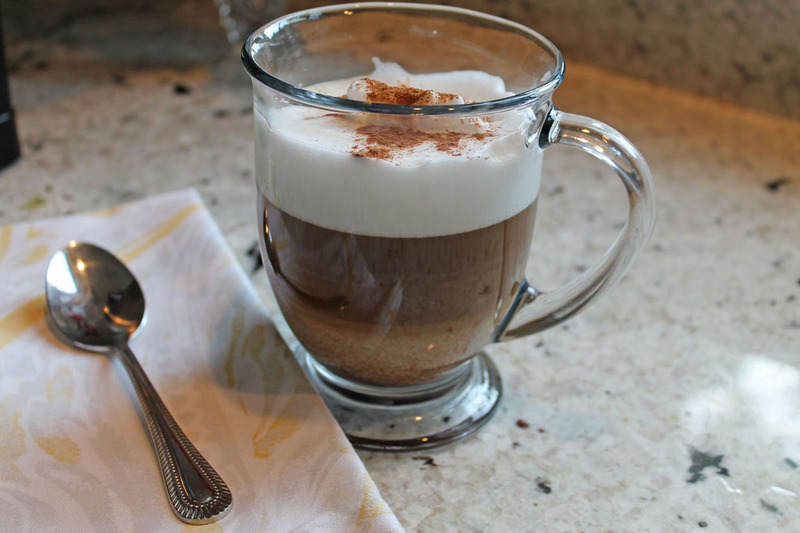 The built-in frother is handy to make a hot or cold froth to top your favorite coffee drink. It detaches with a simple twist for easy cleaning. You'll find the frother to be both handy and essential to making the fancy specialty coffees that go so perfectly with dessert, like cappuccino. Place the milk into a large mug. Warm the milk in a microwave for 30-45 second. Froth for 30 seconds. If using the Ninja Coffee Bar System, set the mug with the frothed milk in place and brew a single cup of coffee using the Specialty button. If not using the Ninja, brew 4 ounces of double strength coffee. Sweeten and sprinkle with cinnamon for garnish. A cup of this cappuccino would pair nicely with Country Life City Wife's pumpkin cheesecake. Pumpkin cheesecake is one of my favorite fall desserts! 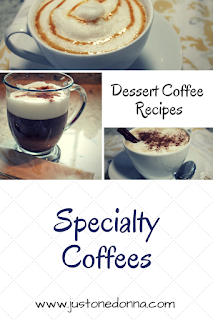 One of Hubby's favorite specialty coffees is a caramel macchiato. 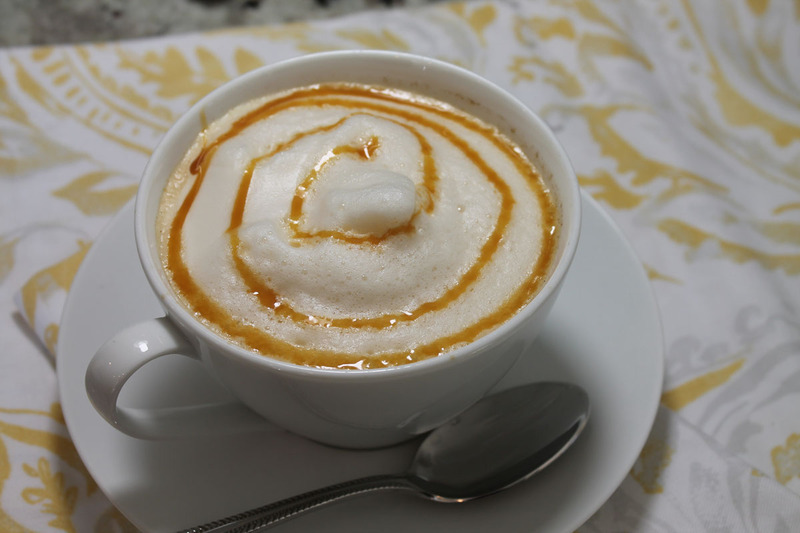 With a nod to him, I'm including this recipe for a Salted Caramel Latte. I think this recipe is a perfect dessert coffee with a touch of sweet caramel flavor. Hubby, on the other hand, thought it should be a bit sweeter. So, if you like sweet, add an additional tablespoon of salted caramel topping to your drink. Place the milk into a 2-cup measuring cup. Stir the salted caramel sauce and milk together to combine. Warm the mixture in a microwave for 30-45 second. Froth for 30-60 seconds, until at least double in volume. If using the Ninja Coffee Bar System, brew a single cup of coffee using the Specialty button. If not using the Ninja, brew 4 ounces of double strength coffee. Holding back the foam, pour the milk mixture into the coffee. Spoon the foam on top. With the squeeze bottle, squeeze additional caramel sauce onto the foam in a decorative pattern. 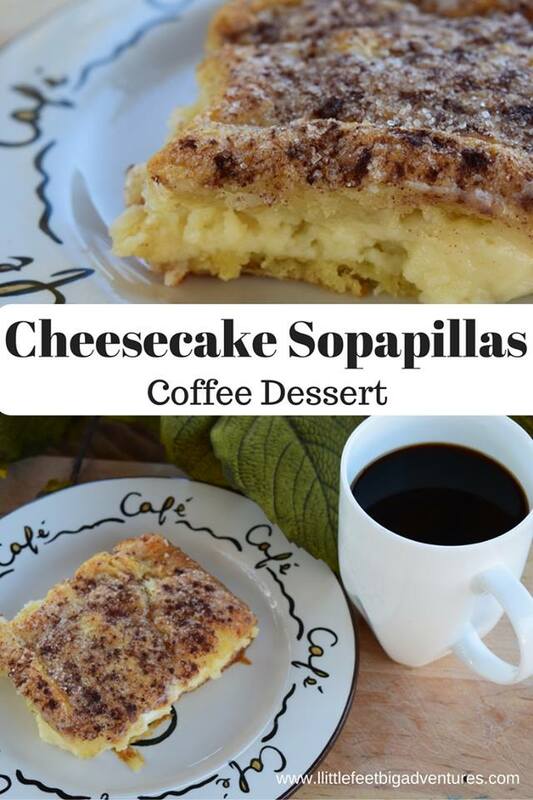 This Salted Caramel Latte would pair very nicely with Little Feet Big Adventure's Cheesecake Sopapillas. Yum! My third dessert coffee is my personal favorite, Kahlua Amaretto Coffee. I order it in restaurants and love to make it at home. For this recipe I changed the setting on the Ninja Coffee Bar System, using the cafe forte setting for a nice, dark brew. Brew strong coffee. If using the Ninja Coffee Bar System, choose the forte brew. Prepare the sweetened whipped cream or make with the frother on the Ninja. Pour amaretto and Kahlua into the hot cup of coffee. Top with the sweetened whipped cream. Sprinkle with ground cinnamon and garnish with a stick of cinnamon for a stirrer. I'm pairing this Kahlua Amaretto Coffee with And Hattie Makes Three's Butter Cake. I love the single cup brew function without using coffee pods. I like to control the quality of the coffee I use in my coffee maker. I have been disappointed with coffee pods. I love the ease of clean up. The coffee basket cleans easily under running water. The frother attaches and detaches very easily and tucks away in the back of the coffee maker. The scoops attach to the side of the coffee maker. I love the versatility of the multiple brew settings. The one thing that doesn't work for me as well as I would like is specific to my kitchen design. The Ninja Coffee Bar System vents at the top of the coffee maker and can put out quite a bit of steam. I have new cabinets in my kitchen and I am afraid of steam damaging the cabinets. I designed a beverage center for my kitchen when we remodeled. The depth of the counter in that space doesn't give me enough clearance to pull the Ninja far enough out from the cabinets to protect them from the steam. That means I have to keep it in a spot on my counter that isn't ideal for me. This might not be an issue for you at all. All-in-all, the pluses with the Ninja Coffee Bar System far outway the one inconvenience I have found. The Ninja Coffee Bar System is a welcome addition to the Just One Donna kitchen. I know you will love it, too! Thanks for visiting, Christy. I hope to see you at the Twitter Party. I love how the cup is elevated. Drip trays can be such a pain! That's a great observation, Brandon. You are so right! There are some drips with this coffee maker, but there is also a drip stop switch to give you control. It doesn't bother me at all. As you note, the lack of a drip tray makes this few easy to clean. I'm loving the ease of clean up! The frother and scoops that attach to the coffee maker is a great all in one, it's all together, plus storage. Genius! Thank you for a great review. I love the multiple brew settings!! I lneed be the versatility of being able to make a cup or a carraf! I'm impressed that you figured out how to make those drizzle patterns in the foam (seriously, I would love to do that). I love the design on this machine. It looks versatile and easy to use. I like that you can make one cup and don't need pods! I love the built in milk frother! I'll take a latte any day! Thanks for the great review! Chat soon! Love that I can make full carafe, a half carafe, or a single cup, in five brew types using the permanent basket!!! The design looks stunning too! It'd be perfect for serving all my guests this holiday season! It'd be sure to wow them with the ease of use and the delicious cappuccinos and lattes. That salted caramel latte sounds so so yummy!!!! Thanks so much for sharing!!! 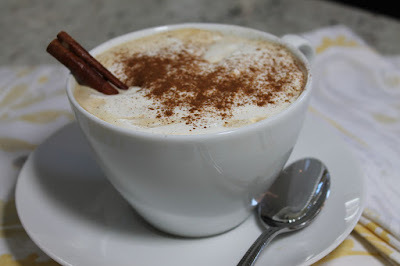 I love coffee and trying different kinds of lattes and drinks!!! So much deliciousness in the dessert and coffee. Both are great pairings to enjoy these holidays. Definitely want a Ninja Coffee Bar System and enjoy a cappuccino with pumpkin pie ! Yes !! I love how you can make a full carafe or just a cup! Really everything about it is amazing! I love all these recipes. they looks so yummy. I like its ease of clean up. I Love the fact that no coffee pods are needed!!! I love the easy clean up! The built-in frother is my favorite feature! So amazing!! The stainless steel and glass give this coffee system a modern look that would go great in my kitchen. And no special coffee pods, how great is that! O my gosh, I need this in my life! I love coffee in all shapes and forms. 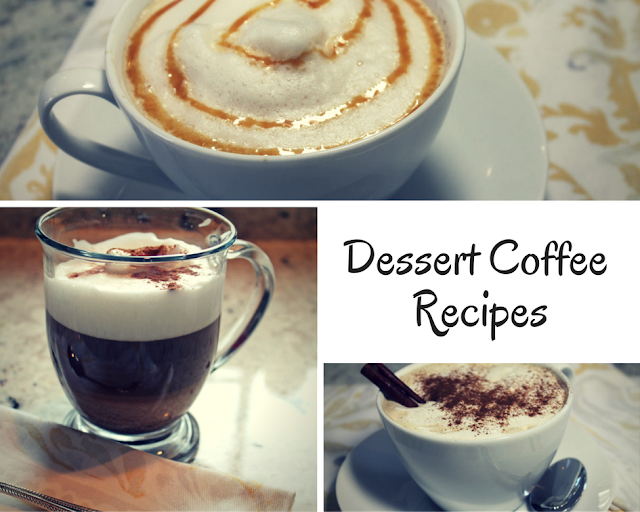 Your recipes have me craving a cup (and dessert) now! I love the different brew settings and NO pods are needed! I like that you can make a single cup and the built in frother. I rather like the variety of ways it can be used and it looks cool as hell. I love that you can make a full carafe & don't need to use pods. I love coffee. Thank you for bringing your post to the Blogger's Pit Stop last week. I love the built in frother! This is one of the neatest products I have seem. I love my coffee, so I love all the amazing things you can make with this! I wasn't going to come to the party, but after seeing your review I really want to win this thing! I thought it was like a Keurig, but it's not. Also my Cuisinart has spilled all over the counter this morning AGAIN. It now sits in a jelly roll pan to catch the coffee. Tired of cleaning out the cabinets and countertop. Kicking it to the curb. This looks amazing! Love the design small but sleek!! Love it has differ brewing options as well so you don't have all the extra wasted coffee for just a cup or two! Fits to your needs!! Ooh wow! I love this! I need a system that can brew 1 cup at a time when I'm home alone. I could make a latte with this! I've heard so many amazing things about the Ninja. I love the built in froth error and the multiple use settings. All I can say is WOW! I would be ecstatic if I won THIS! Wow! This Ninja brewing system looks amazing! I love the 1 cup brewing feature and the built in froth error. With all the multiple use settings it's so versatile. I would be ecstatic if I won this! My old coffee pot takes forever to brew and it's literally about to fall apart. The Ninja would be an amazing Christmas gift! I love the fact that you can make a whole carafe of coffee and a singl cup. Sometimes you only need a cup, sometimes you need more. Amazing! The Ninja brewing system is completely awesome, I'd luv to be able to make some awesome latte's. But I'd just luv to see what all I can make w/it. I love all the different kinds of drinks you can make with it! I like the built in frother! The multiple settings is a great feature also. You can brew as little as a cup! That's great! Love the built in frothier I love lattes!!! I love the versatility in the settings. Love the easy clean up! Easy cleaning is a plus with me! It is versatile with five brew types and a permanent basket! This would be great for holiday entertaining! The Ninja is very attractive...love the stainless steel, glass, and black features! I love the multiple brew settings.